It may be my southern roots or the food that I was raised on, but there is no doubt, that I am a sucker for salt. I had the opportunity to take a great cooking class for amateurs and the chef was always reminding the other students to season their food - this was not something I had a problem with. And while I think proper seasoning is one of the fundamentals of good cooking, I always try to stop just short of where I think the salt level should be. I can always add more at the table and I want to be sure I don't over do it. So, it should be no surprise that I've been doing some salt-focused dishes lately. The salt-cured salmon is a definite keeper, as are these vinegar and salt-cured cucumbers, aka pickles! These could not be simpler and the flavor is great. If you don't love rice wine vinegar, experiment with other varieties and let me know how it turns out. Seasoned rice vinegar is simply rice wine vinegar that already has sugar mixed into it. It's commonly used in sushi preparation to season the sushi rice. If you can't find it, grab a bottle of rice vinegar and stir in about 2 T of sugar before pouring over the cucumbers. Slice cucumbers thinly. Place the cucumbers in a small bowl and add the salt, stirring to combine. Let the salted cucumbers sit for 20 minutes and then rinse thoroughly. Cover with boiling water, then drain. Place cucumbers in a mason jar or other storage jar and cover with seasoned rice vinegar. These will keep for a week or two in the fridge. How fun! My old roommates mom use to make these all the time (so good), I miss having them around and hadn't even thought of trying them myself! 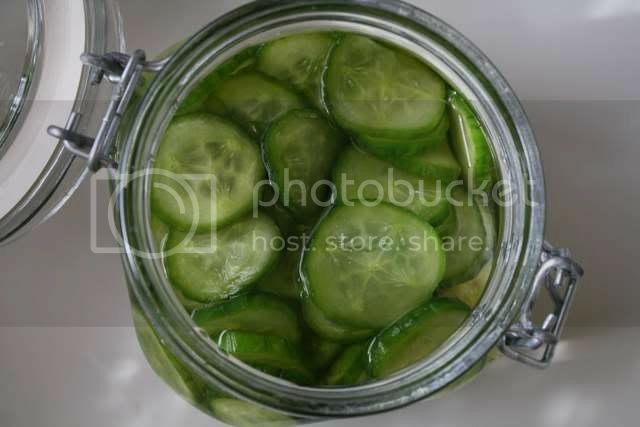 I don't know why its never occurred to me that homemade pickles would be this simple. FAB idea. Thank you. Good on you! I'm with Rebecca, I've never thought to make them myself. And so simple too! Mmmmm, I love pickles. The rice wine vinegar would be delicious, and I've never heard of a lebanese cucumber. 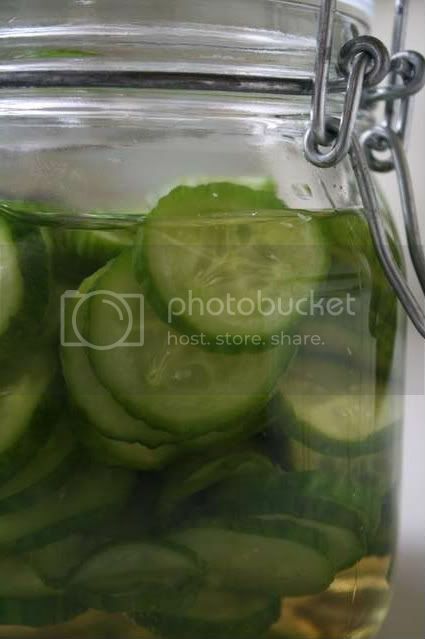 Is that similar at all to a grocery store variety pickling cuke? I love salty food as well. I remember my mom making homemade pickles every year! Yours look delicious! These sounds great, what a good idea and simple too. What do you eat them with, are you like me and like to eat pickles straight out of the jar? I'm a huge salt fan myself. I've never made pickles but I've been thinking about it for quite some time and I'd like to! I make vinegar pickles this way as well. But I just slice them into a Tupperware, add the rice wine vinegar, then a few shakes of crushed red pepper. Yummy. *And* you can pickle all sort of other things - like yellow squash! Congrats on your blog win!